I can’t help it – I’m a fool for the Sunday funnies. You know – the comics. You don’t know, do you. Sigh. Colorful cartoons drawn by actual cartoonists and printed in the Sunday edition of the newspaper in order to give you something to chuckle about. No. They do not move. There is no sound track. They were a feature of my childhood, remained a feature of my youthful motherhood when Rob the Firefighter was young enough to allow me to put him on my lap and read to him, and are to this day a feature of my Sunday mornings. I must say that it was more fun to share the funnies with Rob than it is to share them with Miss Sadie and the Cowboy, but I’m still having fun. Earlier this week – how did it get to be Wednesday for crying out loud? – I saw one I particularly enjoyed. It struck me as not simply gently humorous, but as a message not unlike the messages on the Eastport Baptist Church sign. I take my philosophy where I find it. The tiny image is by way of illustration only, as I am a firm believer in copyrights as well as lots of other rights that belong to the likes of us, and the comic’s copyright is owned by Bil and Jeff Keane. However, I will tell you the punchline. Billy is telling Jeffy “Grandma says if you want to leave footprints in the sands of time you should wear work boots.” I like it. It got me thinking about my own work boots. We have, in order, from the top down: my Beloved Bogs (excellent winter dog-walking, swamp wading, beach clambering, field exploring work boots), my beloved wool slippers (shapeless but sturdy, toasty warm, utterly disreputable writing work boots), and a fine pair of lug-soled hiking boots Maryanne Jorgensen gave me because they didn’t fit her and they do fit me AND my old hiking boots had a hole in the liner the size of a quarter and gave me blisters. I’m thinking that with all these choices in hand I ought to bestir myself to make some footprints before the sands of time run right out on me. Of course first I have to do some dog-walking. I tried to get a nice portrait of the Duo for you, but Miss Sadie and the Cowboy were at odds, or maybe just messing with me, I never know. I need to get some new hiking boots. I have two pair, but it seems the sands of time are pressing everything downward, and my feet are a little larger and wider than they used to be. Hiking boots that pinch are not to be desired. A random question – do the dogs up your way ever wear hiking boots? or booties of any sort? 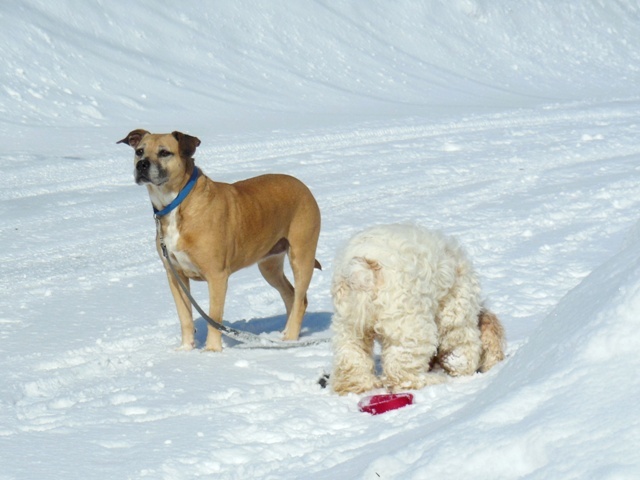 I have a blog friend whose two dogs do wear boots – mostly to keep the snow from balling up between their toes. Of course, she lives in Yellow Knife and throws dinner parties in tents when it’s -30F and generally carries on in ways I would find completely unacceptable, so it may be that dog booties are a good thing for her (and them). Funny you should mention the dog booties. I’ve never had any for Miss Sadie or the Cowboy, but I don’t let them stay outside very long in bitter weather, either. Rob the Firefighter has booties for his dogs because he takes them cross-country skiing. I don’t go cross-country skiing myself, so I’ve never seen them in action, but he says they work very well. However, I have a picture of one little dog who wore booties in California . . .
Goodness that post was a long time ago. The Cowboy was much younger then. Come to think of it, so was I. Over here on our side of the Bay, the wind has been sucking moisture from the accumulated snow, and the snow now has the uninviting texture of blocks of asbestos. The snow is down there somewhere, way underneath. I do like the idea of making our tracks in work boots. But I’m grateful that Sarah had an indoor play date this afternoon and won’t be begging me for a long outdoor adventure when we head home from the bookstore. Slippers — now that’s what I look forward to as evening draws nigh! Mrs Tootlepedal has a grand selection of boots too. She knows the secret of a comfortable life. I admire Mrs. Tootlepedal. She strikes me as a woman of excellent taste and astonishing patience. Well, first of all, I am SO happy you like the comics, because I was starting to feel like I was the only one who ever reads them. I really only buy the papers for the comics, and when they leave them out for some reason, I want to cry. The characters become like family (which sounds pretty sad when I am reading this back). As for the boots, I think they are more important than any other shoe. I love my Keens which keep me dry and are wide enough for my big boats. My dog (Murphy) loves to be outside in the winter but gets those awful snow balls in his paws. I tried Musher’s wax, but he seems to lick it all off before we get outside. I tried a few boots for him but they were so hard to keep on. Then I found what were described as “disposable boots”. They came in a big pack and look like small round balloons (or condoms) and they just pop on his feet and he hardly knows they are on. I have reused the same pair for quite awhile so they are not just one and done. I love them! They also just pop off when we get home, and his paws are clean and snow ball free. 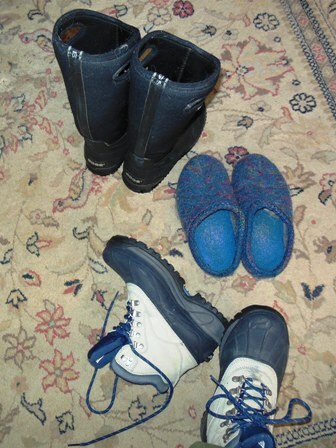 I had a pair of wool fleece lined Keen walking shoes that I loved very much. They came to a bad end, as will sometimes happen to a person who keeps dogs and walks them on the beach in all weather. Ah well. The Cowboy suffers from iceballs on his paws and sometimes flops down on the trail to chew them off. (Er – the iceballs, not the paws.) I read about musher’s wax but figured my dogs would just eat it. Your disposable booties sound good. I have been a reader of newspaper comics for a very long time, and only just recently canceled the paper edition of my local newspaper because I found them piling up waiting for recycling rather than being read, which seemed wasteful to me. But I do still enjoy them – most of my favorites can be found online. Love the photo of the duo – a perfect illustration of what it is usually like for the keeper of 2 dogs trying to get a photo of said 2 dogs together. I would probably cancel my real newspaper if I weren’t so stubborn. And if I had broadband. And if Dean Peters didn’t do such a heroic job of getting it here even in the dead of winter. Oh who am I kidding. I’m a paper news junkie. 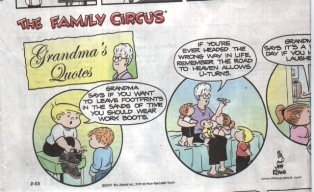 Go to GoComics.com to create your own custom comics page. There are lots of comics, & many that don’t run in my paper. I particularly like Stone Soup & Non Sequiter & Frazz. And since I’m a Calvin & Hobbes junkie, it’s nice to get one of those every day, even though they’re no longer being produced. I think there’s a small cost to subscribe, but imho it’s well worth the money! I don’t like comics THAT much. I just turn to them in my morning newspaper, which folds nicely and, um, absorbs the occasional bit of butter that has been known to be misplaced during my breakfast.